Many dogs hate having their teeth brushed. 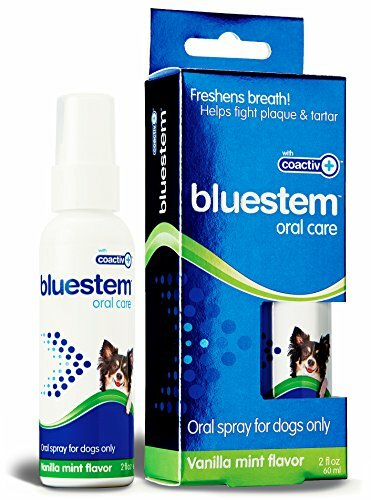 Bluestem's vanilla mint oral spray offers a simple and effective method of oral care. According to the Canadian Veterinary Medical Association, 80% of dogs will show signs of periodontal disease including, red and swollen gums, bad breath, pain, and tooth loss. Small and mid-sized dog breeds are especially susceptible. If left untreated, periodontal disease progresses to plaque buildup, gum recession, loosened teeth, bad breath, inflammation and bleeding of the gums, and eventually loss of teeth, oral infections, and even poor overall health. Bad breath is usually the first telltale sign that your dog has underlying oral health issues. As a pet owner, it is important to do more than just focus on your dog's bad breath. An oral health care regime is important for long-term health. There are a number of things that you can do to ensure good oral health for your pet. An easy to follow oral care routine can reduce the likelihood of periodontal disease, discomfort for your dog and costly teeth cleaning visits to the vet, which often require general anesthetic. Use daily for best results. Lasts approximately 2-3 months. The vanilla mint flavor freshens your pet's breath - fast! 【 A TRUSTED COMPANY 】As fellow pet owner's and lovers we understand the importance of safe products for our furry little friends, that's why our products are made and tested in our laboratories here in North America. Our oral spray is Notified under Health Canada's rigorous VHP (Veterinary Health Products) program. Many other pet oral care brands do not comply with Health Canada's regulations. Our mission is to make sure we are looking out for your pets' long term health. 【 ENJOY YOUR PET'S KISSES AGAIN 】 Although loving affection from your dog can be one of the joys in life, one with bad breath can ruin your day. By simply applying one or two sprays a day directly on their teeth, you can easily enjoy their kisses within just a few days. Kissing aside, did you know that the main indicator of dental problems is bad breath? Our Oral Spray not only freshens breath but helps fight plaque and tartar as well. 【 SAFE FOR DOGS 】 - We've gone the extra mile to ensure that our dog oral spray is safe for your pet. Our food-grade ingredients are alcohol-free, xylitol-free, chlorhexidine-free, and sugar-free. They DO NOT contain any surfactants or detergents. Dogs will like the mint flavored oral spray and humans will like their pets healthy mouth and fresh breath. IT'S A WIN - WIN. For optimal results, use in combination with bluestem water additive and toothbrush & toothpaste. 【 HELPS FIGHT PLAQUE AND TARTAR 】bluestem coactiv+ technology has been shown to help reduce tartar without brushing by up to 25.4%*. According to AVDS, 80% of all dogs and cats will suffer from dental problems by the age of 3. Did you know that dental disease is the most preventable illness in pets? When you establish a daily routine of dental health using an Oral Spray, you are providing a healthier future. *Study conducted using bluestemTM water additive, study summary available upon request.